Radiocentre has been representing the British radio industry in Lausanne, Switzerland at Radiodays Europe. Radiocentre CEO Siobhan Kenny spoke to the audience, consisting of 1,500 industry members, about the recently launched Audio Content Fund and the SME advertising initiative AAccelerate. Also speaking at the event was Mark Barber, Radiocentre’s Planning Director, who addressed the importance of brands maintaining an advertising presence through a recession, and Radiocentre’s Judith Spilsbury, providing some top tips for persuading reluctant radio advertisers to invest in the medium. Siobhan Kenny discussed the AAccelerate scheme aiming to boost the advertising market by £2 million over the next two years. Current case studies from the initiative include the energy bar Grenade, which through a new advertising campaign which includes radio, has seen positive results. Mark Barber addressed the elephant in the European room – Brexit. With the continental consequences unknown about what will happen when the UK leaves the EU, Mark showcased the evidence on why it’s important that organisations continue to advertise through economic difficulty and how radio can help. A summary of his analysis, with practical guidance on why and how advertisers need to maintain advertising spend in uncertain economic times is available here. 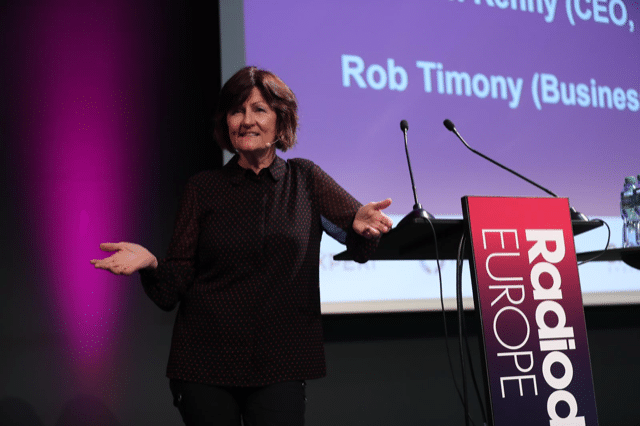 Judith Spilsbury gave the audience some top tips for how to persuade reluctant radio advertisers to invest in the medium, with an interactive presentation to a packed out auditorium. You can hear from some of the other speakers in our Radiodays Europe Podcast special below.